June 17-21st and June 24-28. You can sign up for 1 or 2 weeks. Students will adventure into the mountains to explore medicinal plants, participate in permaculture & farming projects, explore food as medicine, folklore, music, art, games, fun, explore land based spirituality, and have a chance to engage in the great multicultural traditions of the surrounding area. If you would like to sponsor a student or make a donation to this program please click the button below. Henrietta is from Taos Pueblo and guides the Taos Pueblo Gardening club for youth. Her family grows corn and she sells cornmeal and tamales. She is a much respected elder in the community and we are fortunate to have her share time and fun with the youth for a day. Alexandra aka Citlalmina (as known in her Kalpulli), has been a self studied and certified community herbalist for the past 8 years. Her studies began in learning about European herbology and wild crafting. Over the past two years has her knowledge of medicinal plants expanded to Western/South Western herbs, as she aspired to get closer to her Mexika roots through this plant knowledge and other ancient wisdoms of herbal midwifery. 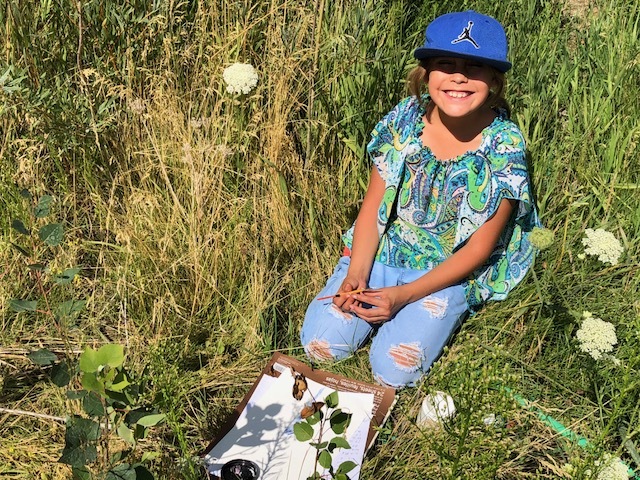 Alexandra currently works a Southwestern Herbology teacher for Taos Municipal schools-enjoying her time with 4th and 5th graders- in hopes of inspiring the children to hone in on their local medicinal plant knowledge and deeper ancestral wisdom. Alexandra has been deeply involved in her studies as an apprentice in Kalpulli Teocalli Ollin with CC and D'Santiago Nava for a little over a year. She is also a dedicated dansante of 1 year with Tanya Ocana Vigil, her capitana, in Taos. Started to study astrology at 16 years of age and herbs at 17 years of age she had an aunt that taught her a lot of the stars. Various other people on the herb path that she met taught her, so almost 50 years of study have been teaching 40 of those years and the last 10 at UNM. She grows herbs, writes about herbs, paints herbs and has made about 200 formulas. They have been in stores across the land before the world got strange about herbs. She has come to the herbs mainly through the European version and has learned some of other Traditions along the way. Noberto Armijo grew up in Ojo Sarco and Chamisal, New Mexico. He has been doing agriculture for over 10 years; he has integrated a business degree from UNM with small scale agriculture to help connect himself back to his roots of the land. Noberto is passionate about acequia culture as well as the importance of the land and water. He was a mentor for youth in Sembrando Semillas through The New Mexico Acequia Association for 8 years. Noberto was also the regional farm trainer/ farm manager at Northern New Mexico College’s Sostenga Farm in Espanola, NM through the American Friend Service committee. Here his goal was to train farmers in small scale agriculture using organic farming practices, business tecniques , hoop house construction, and marketing tactics to help students create a economically viable business based on off the land. Noberto has constructed 15 greenhouses and currently runs a business helping people to install native ecoscapes, medicinal and food based landscaping and drought resistant lanscapes in Northern New Mexico. He also farms 3 acres of land in Taos, NM. Sliding Scale $250-350 per week scholarships available.